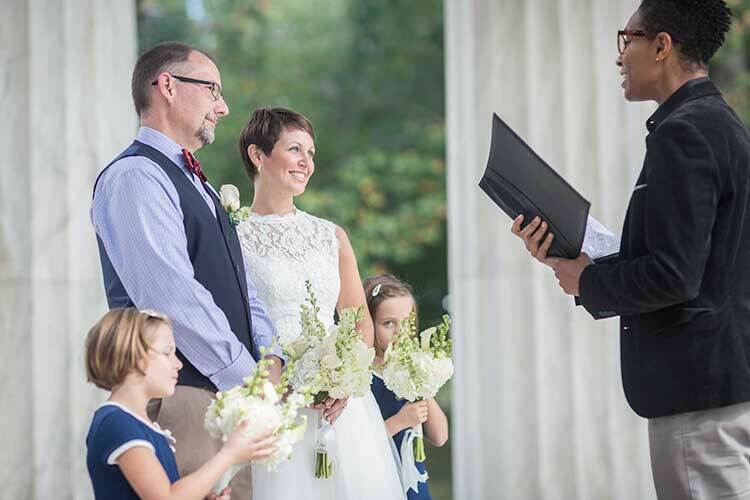 Nicole & David shared their vows with one other (and their daughters!) at the DC War Memorial, one of our favorite places to get married in DC. We asked them about their special day, and here is what they said! David and I live in North Carolina in the Raleigh-Durham area. We met through work when our departments were brought together to focus on a large corporate project. We became close friends and cautiously decided to take the next steps towards dating. We have been together for three years. 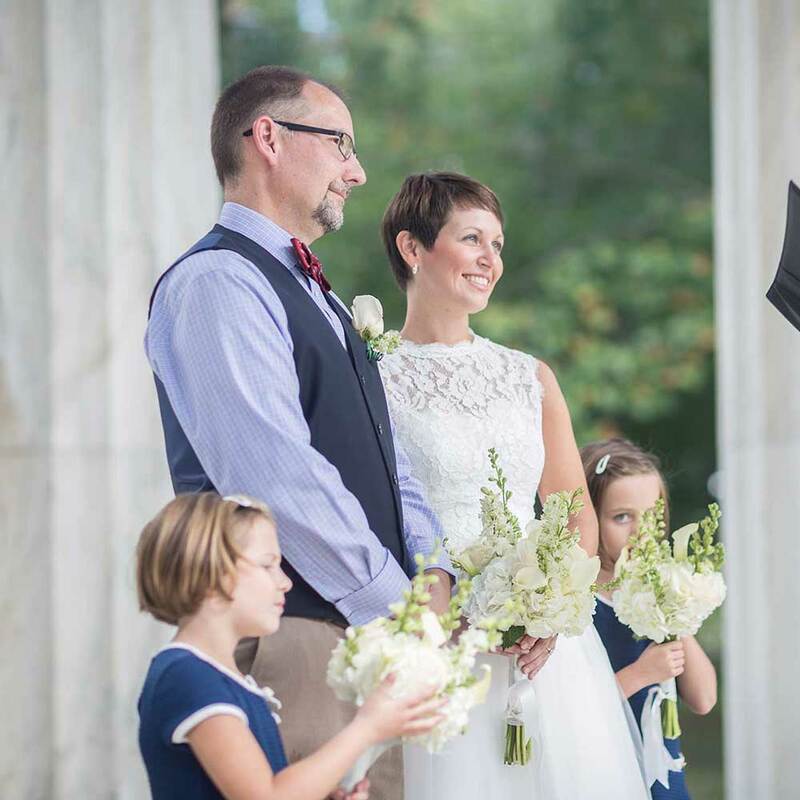 An elopement just seemed to be the right fit our personalities and lifestyle. It allowed us to still have a beautiful venue and keep the elements of our ceremony that were important to us. Choosing to elope also minimized the stress of planning a wedding and was simply more budget friendly for both us and our loved ones. David had actually been living in DC for about 4 years when we started dating. I would drive up on weekends and we would spend time going to shows, visiting great museums and eating fabulous food. It has been a special place for us and there is always so much do and see. I love the fact that you could be standing in front of the White House and then sitting down to eat crabs on the Chesapeake within the hour. DC Elopements was the first place that came up when I started my search and there really was no need to look any further. My marriage license and certificate, wedding date, venue, officiant and photographer were all coordinated with a few emails and clicks. They took care of everything and it was completely stress-free. All we literally had to do was show up. It almost felt too simple and good to be true, but it really was that easy! I loved the intimacy of our wedding and the fact that our officiant tailored her words to reflect our thoughts and beliefs. Our photographer was right there to capture those little moments before the ceremony and of course the ceremony itself. We also had a lot of fun posing for pictures at the monuments and ended our day with an amazing dinner at a local restaurant!